Stacey and Jason Bandish were looking forward to some much needed sun and fun on their September Caribbean cruise. The Pennsylvania couple boarded Royal Caribbean’s Freedom of the Seas in Port Canaveral in a festive mood and felt at ease when they handed over all their luggage to the porter, which would later be delivered to their stateroom. As the ship headed off into the sunset the festive mood turned into frustration when their luggage never showed up. After dinner the Brandishs realized their bags were never delivered to their stateroom. Immediately they informed their cabin steward to see if he could find the missing bags. When the couple returned from the evening show they were happy to see their luggage had arrived, but there was one piece missing. 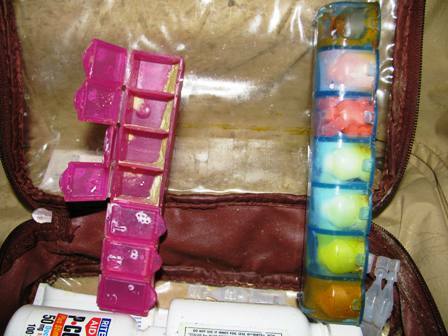 Even worse it was the carry-on bag carrying important prescription medications. Ironically, this was the bag that Stacey Bandish kept with her during her airline flight to the port. The couple went to the Purser’s Desk to inquire about their missing bag. They were informed that there was a group of luggage being detained after being X-rayed because they contained irons. Personal irons are banned on cruise ships because they are considered a fire hazard. The Bandishs did not pack an iron, but thought their bag must be in the group –it wasn’t. They were then told to file a report with Guest Services. At this point Stacey Bandish’s allergies were acting up and she was beginning to worry about not having her medications. Shortly after filing the report and returning to their stateroom they received a call from Guest Services stating that the bag had been found and they could pick it up. After receiving the bag they realized something was terribly wrong – all the contents inside were wet. “We were amazed that there was no warning of the luggage being ruined – or what had happened,” said Stacey Bandish. A frustrated Jason Bandish returned to Guest Services to find out why the bag and all its contents was water damaged. He was then told by a crew member that there was an “incident” and that the bag had fallen into the water while being loaded on the ship. The crew never could explain why the couple was not informed of the incident and subsequent damage when picking up the bag. Bandish was then told to return in the morning to file a personal property report. The damage to the bag’s contents was devastating – five expensive prescriptions and a number of over-the-counter medications that were packed in daily dose pill containers were destroyed along with costly cosmetics, personal grooming items and appliances, and small electronic equipment. Additionally, Stacey Bandish’s beaded jewelry was damaged. Fortunately, most prescriptions were able to be quickly refilled by the ship’s medical staff; however, not all items were available and some that were re-filled were substitutions from original prescriptions. Unfortunately, the interruption and substitution of medications led to some health problems. On the fifth day of the cruise Stacey Bandish had an asthma attack and had to be put on additional medications by the ship’s doctor. To add insult to injury much of the couple’s time in port was used to fill prescriptions and over-the-counter medical supplies not available onboard the ship. When the Bandishs returned home they wrote a letter to Royal Caribbean detailing their issues along with an itemized list of what was destroyed along with the current replacement costs – a whopping $2,150. A Royal Caribbean luggage department employee wrote back stating that jewelry and electronics were not covered in any claims. Additionally, the employee noted that receipts must be provided for each item and that the receipts could not be older than six months from the sail date in order to be accepted. Feeling cheated the Bandishs contacted ExpertCruiser for help. I spoke with Cynthia Martinez, manager of corporate communications for Royal Caribbean. She wasn’t sure how the luggage ended up in the water, but she noted that 13 guests in six staterooms also had their luggage damaged. According to Martinez, Royal Caribbean’s liability limit that is stated in the ‘Cruise Ticket Contract’ is $300, but they went way above that amount for the Bandishs. Martinez says the line replaced medication that totaled $483.60. Additionally, visits to sick bay were covered at a cost of $295. The line also covered daily hair styling in the salon for Stacey Bandish at a cost of $212.00. Overall, the Bandishs will receive $990.62 for the aforementioned expenses and a $700 future cruise credit. The couple is disappointed by Royal Caribbean’s stance. Is the compensation fair? It all depends how you look at it. The line did promise to cover the onboard expenses and tried to pamper Stacey Bandish with daily salon visits since all her hair styling equipment was destroyed. Unfortunately, the monetary compensation doesn’t cover all items lost – including the very piece of luggage destroyed. I have mixed feelings about future cruise credits in these situations. Basically, it’s telling the guest that receives it to spend more money to recoup the loss. Stacey Bandish admits she made a big mistake handing over her carry-on bag to the porters. It’s a common error many cruisers make once they get to the pier – they get too comfortable and let down their guard. After all, the bag is there next to the ship, it will get to my stateroom damage free, right? Au contraire. I’ve witnessed cruise line luggage handling that rivals the bag thrashing showcased in the old Samsonite gorilla commercials. Never check medication and expensive items, always carry them with you. That way you’ll be able to enjoy your cruise and sail off into the sunset without a care in the world.